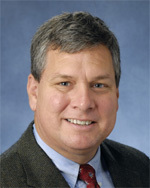 James Stiles joined KU's Department of Electrical Engineering and Computer Science in 1996 and is a member of ITTC's Radar Systems and Remote Sensing Laboratory (RSL). From 1983 to 1990, he was a microwave systems design engineer for Texas Instruments; and from 1990 to 1996, he was employed as a graduate research assistant in the Radiation Laboratory at the University of Michigan. PhD., Electrical Engineering,The University of Michigan, Ann Arbor, 1996. M.S., Electrical Engineering, Southern Methodist University, Dallas, TX, 1987. B.S., Electrical Engineering, University of Missouri, Columbia, 1983.
electronics, electromagnetics, radar, microwave engineering.